The CSC 490 course was completed in August 2008. (My mark was A+). I'm continuing work (slowly) on Space Prisoner, with the intention of eventually releasing it as shareware. I've done a major update from v0.19 to v0.20. It was a LOT of work but I think the game will be a lot more fun because of it. The storyline has been completely revamped - instead of simply killing the enemy ships to complete a level, you have to rescue allied prisoners who are encased in the asteroids. The cube is a huge space prison, and your job is an ongoing rescue mission. I'll have a more detailed update soon, as well as some new screenshots. - the Allied ships look like the player ship, but are red instead of blue. They will actively attempt to hunt down and kill enemy ships in the arena. Quite helpful! But of course they steal points from the player this way. I'll be in New York City for a week, so the next update will be in 10 days or so. - Increased asteroid size by a factor of 4+. This makes them easier to hit, but also tougher to avoid. In general I find that it makes the asteroids more a part of the game when they are bigger. - I found that the less text I render, the better. There was a dramatic speed improvement when I removed the debugging text. After much reading, internet googling and experimentation, I've been able to implement quaternions as the basis for ship orientation and movement. Still lots of work to do though, as many items (such as the shot spawn routine, and enemy analysis of which direction to move for attack) are still Euler-angle based. For now, though, v0.09 is the first version which allows true 3D movement, uninhibited by gimbal lock. My goal for version 0.10: to have it as fully functional as the last Euler-angle based version, with shots and enemy AI all working normally but using quaternions. All ships (including the player) now have regenerative capability. Energy levels slowly restore over time; the rate of recovery is proportional to the amount of energy available. The next major obstacle is overcoming gimbal lock; it's too obvious a problem to be ignored. The only viable solution is conversion of the 3D orientation algorithms from Euler Angles to Quaternions, an extension of the complex numbers first studied by Hamilton in the 19th century. They were thought to be of very limited value until more recently, when their functionality as a 3D orientation system was discovered. 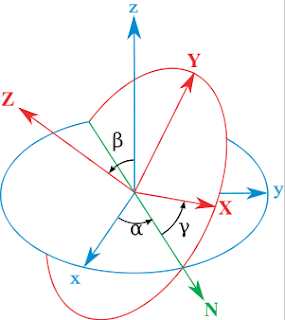 They avoid the problem of gimbal lock completely but the tradeoff is their nonintuitive nature; it's difficult to immediately sense a direction from a given Quaternion, the way one can with Euler Angles. - Levels: a level ends when all of the enemy ships are destroyed. When the new level starts, new enemies (and asteroids) spawn. - Lives: the player is no longer invincible, and has a limited number of lives (3 for now). - Action screen display: informs player of important state changes (eg: "Level 1", "Level Complete", "Ship Destroyed", "Game Over"
The project is now an actual game, with a start and finish. The graphics are all still extremely basic for now; essentially they are placeholders until I finish working on gameplay basics and start concentrating on the "look" of the game. This won't be for a while yet as there are still many basic elements in need of attention, such as enemy AI, screen information, level loading parameters etc. Finally got the movement and shot-firing directional vectors working properly. Then, the radius r is simply the magnitude of the vector; that is, how fast the object is going. - Sounds are now implemented using OpenAL and .wav files. I've got various shot and explosion sound effects as well as a background theme that a friend wrote some years ago. - The computer ships now have the ability to fire shots. They are still "dumb", mostly just thrusting around randomly, but I want to make sure all of the ship functionality works perfectly before concentrating too hard on AI. - Added an external spectator view option, and found (after looking at the player ship from an external viewpoint) some bugs with my orientation routines. I've managed to largely fix the bugs after some hours of frustration. - A major internal change (and surprisingly difficult to make happen), is that the user's ship, instead of being a unique, specialized (and therefore wasteful) data construct, is now identical to all of the computer controlled ships. Instead of computer-generated inputs to direction and thrust, however, the player directly manipulates the controls. But the ship itself is identical to the others. 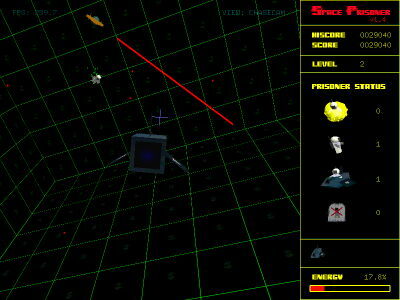 This ensures that the player's ship and the computer ships are subject to the exact same physics laws, and it also automatically makes the player ship vulnerable to pulverization by shots, asteroids and other ships, without a lot of extra code. - An added nice side effect to the above change is that it's now trivial to change the camera view to show the viewpoint of any object in the game. - There are now 3 different kinds of asteroids: small, medium and large size. The large and medium ones take damage when hit, and eventually crack apart into smaller asteroids. - The asteroids "tumble" through space now instead of drifting without any rotation. - Added more performance diagnostic text to the text bar. A "maxObj" display shows the maximum number of active objects seen during the game. This will help me to determine an optimal size for the object array. Added text. After poring through the Red Book and researching text display options online, I decided to start out with the easiest solution, which is the included GLUT utility, glutStrokeCharacter. I moved the main action window to the left of the screen, and created a 2D, orthoganal projection text info strip on the right side. The text characters came out extremely large, so currently I am scaling them to make them fit. Later I'll play with the viewport dimensions to try to minimize the scaling operations. 1) Carefully extricated all of the pure drawing code from each object type; each type now has its own pure draw routine allowing for more clarity and ease of adjustment. 2) Refined the drawing code, removing a fair number of unneccessary calls. 3) Adjusted the lighting model, removing unneeded code and refining the "look" of the lighting. The forward/back keys now control a thrust component instead of arbitrarily changing the position of the camera. Thrust is applied in the direction of the camera view. 2) Removed the pseudogravity which caused shards from exploding ships to "fall" to the "ground". The game will be based in zero-g, so all particles should react accordingly. Therefore there exists no real "floor" or "ceiling" to the cube arena, but the walls may be distinctly textured to help with orientation while playing. Revamped data structures to improve expandability and portability. Essentially I changed the objects array to an array of pointers instead of an array of static code. This allows easier access to the array from various different code files, but has the unfortunate side effect of slowing things down a bit. My plan for tomorrow is to fine-tune it and carefully examine the code and see if I created a slowdown in the process of converting the data types. Added fullscreen mode and automatic 1024 x 768 resolution switching. • Tinkered with size of objects array. Currently set at 3000 which runs great on my MacBook Pro. Created this blog. Its purpose is to provide easy reference to the latest state of the CubeRoids project. Updates to this blog will be at least weekly, but I hope to update it more frequently than that.